We hope your Memorial Day weekend was a great start to your 2016 season. It looks like the year is shaping up well for everyone. We too have also been busy and are excited to announce the launch of our new website! AttractionSuite.com has been updated and we want to share the changes with you. We also wanted to be sure that you are able to navigate the site so you can still log into your calendar and reach our support team. Keep reading to find out how to continue business as usual. When you first go to http://www.attractionsuite.com next week, you will see a dramatic change in layout and feel. We hope that it excites you about what you do for a living! Our design team strove to bring out the fun in your business. We exiled the corporate look and went for laid back with a side of thrilling. Of course, we wanted to provide information for potential customers, but also kept our current customers in mind. On the new navigation bar, you have your own tab. It is labeled “Current Users.” When you hover your mouse over that label, you will see your options. 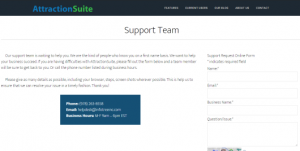 They are to log into AttractionSuite (same way as always), pay your invoice on the same pay form, and to reach our support team. Only the Support page has changed. Here you can find all our up-to-date contact info. In addition, there is a form where you can submit a question that goes straight to the help desk. Feel free to check out other pages when you get there, but those are the most important pages for you to be aware of. Big changes are coming and you can always stay current with our blog and Facebook page. Have a great weekend!